Flowers are blooming, bluebirds are flitting, baby bison are frolicking, roads are open and hotels and campgrounds are opening up. Here are a few things to know for heading into Yellowstone this weekend. The state of the roads is always a consideration. The joke is that the West has two seasons: winter and road construction. The park’s major roadwork this season is on the Mammoth-Norris stretch, with the actual construction centered south of Swan Lake Flats, park spokesman Jonathan Shafer said. The park website says to be prepared for up to 30-minute delays between Indian Creek campground and Roaring Mountain. On June 4, nightly closures will go into effect. The road between Mammoth and Norris will be closed from 10 p.m. to 7 a.m. five nights per week, excluding Friday and Saturday nights. Campgrounds located at both ends of the construction will be open—Indian Creek and Norris campgrounds. An unscheduled road closure is currently in effect on the road between Canyon and Lake. A break in a water line washed out a section of roadway between the South and North Rim drives south of Canyon Junction, Shafer said. The exact date the road could reopen is still uncertain, he said, although crews are working diligently. Visitors at Canyon Junction may access the North Rim Drive, but cannot travel to the South Rim Drive without driving the long way round via Norris, Madison, Old Faithful and Lake. Visitors headed north to Canyon to Lake may access the South Rim Drive, but would also have to drive the long way round to access the North Rim Drive. Call (307) 344-2117 for a recorded message about current road conditions. At the Canyon area, several viewpoints will be closed during the Canyon Overlooks and Trails Restoration Project. On the North Rim, Inspiration and Grand View Points are closed, along with a section of the North Rim trails. And on the South Rim, the Uncle Tom’s Point and the parking area will be closed for construction. Reopening is scheduled for the fall of 2019. 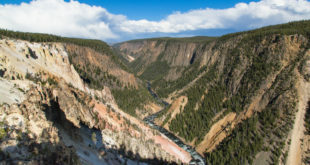 The vertiginous Uncle Tom’s Trail, which takes sturdy visitors down toward the bottom of the canyon via metal stairs is open, but can only be accessed by hiking the South Rim trail from Artist’s Point. And one more project—nearly complete—is the new Grand Prismatic Overlook. The new overlook is most easily accessed from the Fairy Falls trailhead, north of Old Faithful. The trail was built on the hillside to the west of the popular spring, which is located in Midway Geyser Basin. The trail is expected to open to the public no later than July 1, and once it’s open, it’s going to be popular. The last section of park road to open, Tower to Canyon, over Dunraven Pass, is scheduled to open Friday, May 26. And the Beartooth Highway, between Cooke City and Red Lodge, is also scheduled to open Friday. Crews have been working hard to clear the roadway. Heavy spring snow that fell Wednesday, May 17, didn’t help, but May 26 is still the scheduled opening day. Locals in Coke City and Silver Gate say it’s not uncommon for the road to close temporarily again after the weekend opening date. Hotels and campgrounds are opening up, too. Hotels and cabins are open for the season with the exception of Canyon, Roosevelt and Lake Lodge cabins, all of which open after Memorial Day. The Mammoth Hot Springs Hotel is closed for major renovation, but the cabins are open for business, Rick Hoeninghausen, spokesman for park concessioner Xanterra Parks and Resorts, said. Some hotel rooms at Mammoth will be available beginning Aug. 15 and are already in the Reservations system computer available for booking, he said. Most campgrounds are open, with Canyon opening up May 26 and Grant Village on June 9. Some park campgrounds are still on the first-come, first-served system, but the larger ones are managed by Xanterra, and reservations may be made online for Madison, Canyon, Bridge Bay and Grant Village campgrounds, along with the Fishing Bridge RV Park. Campground reservations are tracking ahead of this same time last year, Hoeninghausen said, and they tracked ahead of the previous year as well. Hotel reservations are also tracking ahead of last year. Hoeninghausen said with demand increasing, visitors hoping to reserve for this summer or next might do better reserving online. The call volumes are currently high, and callers might experience busy signals. The company has even increased its phone lines, he said. China continues to be a major market, with about 3 percent of Xanterra’s business coming from that country. But the vast majority of visitors to Yellowstone are Americans, Hoeninghausen said. The U.S. remains a popular destination, he said, especially following, sadly, political upheaval and terrorism in other parts of the world.